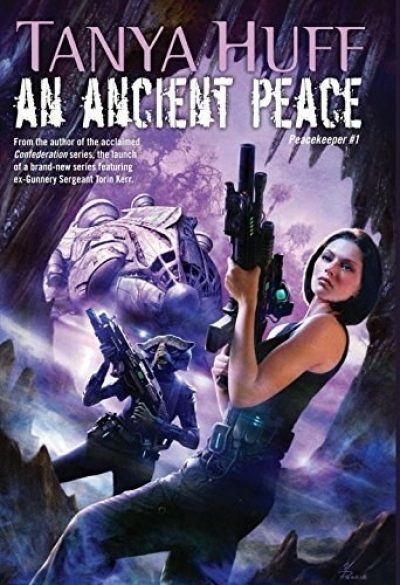 Set in the same Confederation universe as her Valor novels, 2015’s An Ancient Peace is the first volume in Tanya Huff’s Peacekeeper series. A covert op seems like a useful application of the skills of Torin Kerr’s elite squad … as well as a welcome distraction from the revelation that the war that killed so many was an enigmatic civilization’s science project. And it’s not as if the op is unimportant: the future of the human and other Younger races may depend on what it finds. Peace, love and understanding are fine things, but when the Confederation-Primacy War broke out, the Elder Races needed beings who were willing to fight and die for the Confederation. The capacity for violence is the common feature shared by all the peoples deemed Younger Races. This temporary utility is the only reason that the Younger Races were allowed to join the Confederation at all. With the war over, many Elders question the wisdom of allowing the Younger Races full status. The H’San are the Eldest of the Confederation’s Elder races. They were the first to grow past the desire for violent conflict resolution, the founders who created the Confederation and the ethic for which it stands. Rather than beat their swords into plowshares, however, they entombed their now unwanted weapons on their former homeworld, preserving them as a reminder of the bad old days. Vast troves of weapons using technologies almost magic to the comparatively backward Younger races seems to be an irresistible lure to someone. At least, artifacts from the H’San tombs are turning up for sale, which means someone is robbing those tombs. An open investigation might exacerbate Elder and Younger Race frictions. Better to give the job to a group of … off book contractors, agents who can be disavowed if exposed. The good news is, Kerr’s team has a vague idea where the tombs may be found. The bad news is it is a very vague idea: all the H’San have let slip about their former home system is that it was abandoned because their star became a red giant. The red giant phase of a sufficiently massive star is short and red giants are therefore rare. That means almost all of the four hundred billion stars in the Milky Way can be ruled out. That only leaves many millions of candidate systems to sift through. Finding the right system may be the least part of the problem. The H’San are idealists, not idiots. They do not rely entirely on security through obscurity. Anyone foolish enough to break into the labyrinths will soon discover some very interesting undocumented features waiting for them. Not to mention grave robbers; Kerr expected those. The zombies, now, those came as a complete surprise. It is interesting how advancing past the need for violence doesn’t mean that such *evolved* civilizations will also have outgrown the temptation to be snobbish, judgmental dickheads. A short way into the book I began to suspect that the tendency of the Elder Races to sneer at the Younger Races might just come back to haunt them. But first a word about stellar evolution and time scales. When I said the red giant phase is pretty short, I meant “as stars measure time.” As living beings measure time, it is comparable or longer than the average lifespan of an entire species. Either the H’San had bad luck in their choice of home system (perhaps it was a more massive star than the sun and evolved faster or perhaps they just showed up a lot later in their star’s life than we did) or they’ve been around a lot longer than Kerr suspects. Or their weapons included a stellar evolvinator. This book can also work as a standalone and as an introduction to the new series. An Ancient Peace is available here (Amazon) and here (Chapters-Indigo). 1: There are a lot of settings for fantasy and science fiction novels in which it’s only simple prudence to execute everyone who expresses an interest in archaeology. Those Ancient Tombs might contain a backup copy of the Blight , a would-be dictatoror just an angry, hungry god. This is not one of those settings. In addition to having pretty good security, the H’San don’t seem to have stored any actual Sealed Evil in a Can That Will Surely Consume Us All If It Escapes As It Surely Will Given Enough Time. Good for them.